home Blog April 15, 1912 – TITANIC SINKS IN NORTH ATLANTIC! 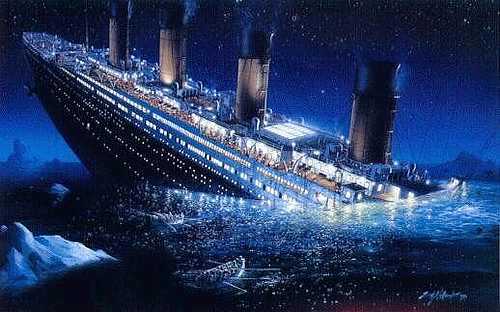 April 15, 1912 – TITANIC SINKS IN NORTH ATLANTIC! It was the largest and most luxurious ocean liner of its time. Captained by Edward J. Smith, the RMS Titanic left Southhampton, England, for New York City on April 10, 1912. Four days later, at 11:40 pm on April 14th, the ship struck on iceberg in the North Atlantic, south of Newfoundland, Canada. In the early morning hours of April 15th, the Titanic broke in two and sank to the ocean floor. April 15, 2012, is the 100th anniversary of a maritime disaster that continues to fascinate people around the world. East Central Regional Library has a wide variety of materials on the Titanic in various formats that can be requested and borrowed from your local branch library. These are only a few of the items you’ll find in the ECRL catalog. For additional materials in various formats (for children, teens, and adults), access our homepage at www.ecrlib.org and click on “ECRL Catalog” on the upper left. And remember that library staff are always happy to assist with queries and suggestions!